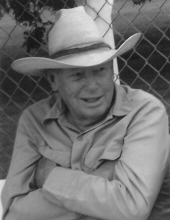 John Reames, age 85 of Albany, passed away Friday, April 5, 2019. Graveside funeral services will be held at 2 pm, Monday, April 8th in the Albany Cemetery with Rev. Jeff Pleasant officiating. Interment will follow under the direction of Morehart Mortuary. Visitation will be held from 4 pm to 6 pm, Sunday, April 7th at Morehart Mortuary of Albany. John Douglas Reames was born June 1, 1933 in Albany, Texas to V.A. Reames and Grace Tankersley Reames. He grew up in Albany and graduated from Albany High School in 1950. Following graduation, He attended classes at Sul Ross University. John married Olivia Mae Salters on June 14, 1955 in Albany. Mr. Reames owned and operated Reames Elevator and later retired as a rancher from the Reames Ranch. He was a member of First Baptist Church, a Shackelford County fireman and enjoyed riding bulls in his younger years. He was preceded in death by his parents; one sister and brother in law, Barbara & Ed Petty. Mr. Reames is survived by his wife of 63 years, Olivia Reames of Albany; two children, Melissa Lee & husband Richard, John Ross Reames & wife Ramona, all of Albany; five grandchildren, Ace Reames & wife Lori of Albany, Josh Reames & wife Amanda of Seminole, Cody Lee & wife Mackenzie of Pleasanton, Erica Wheeler & husband Tony of Albany, Brandi Jenkins & husband Charlie of Hamlin; nine great grandchildren; one niece, Melinda Winn & husband Steve of Dallas, and his precious companion, Sweetie. Memorials may be made to Ben Richey Boys Ranch and may be left at Morehart Mortuary. Condolences may be made online at www.morehartmortuary.net. "Email Address" would like to share the life celebration of John Reames. Click on the "link" to go to share a favorite memory or leave a condolence message for the family.